I've had a quite few days on my blog. I'm not sure why though.... I've had cards made since late last week and I totally forgot to take pics of them. OOPS!!! I was in a CAS mood when I created this card. For my card, I've used the Stamping Bella set called "Rain never stopped me a Bella" and used only the sentiment from the set. The DP is from Bella Blvd that I've been hoarding. I cut the sun and clouds out using some of my MFT dienamics and both have been sponged with corresponding ink. Easy peasy!!! Great card, Angela! 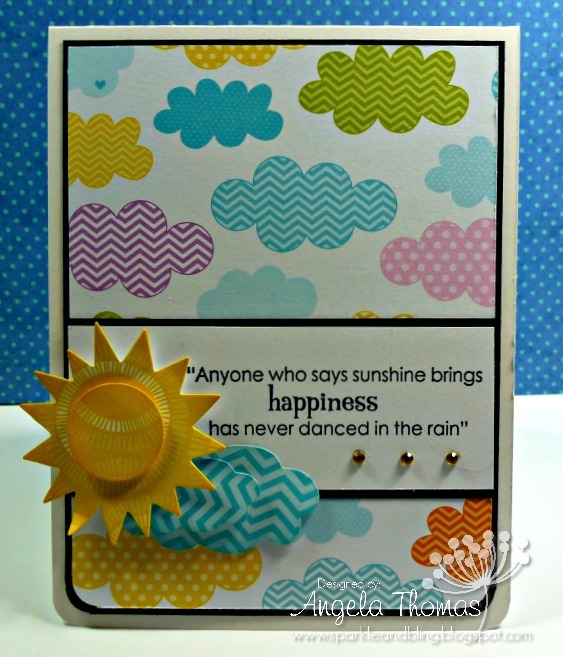 Love those papers and the sentiment is perfect with them!